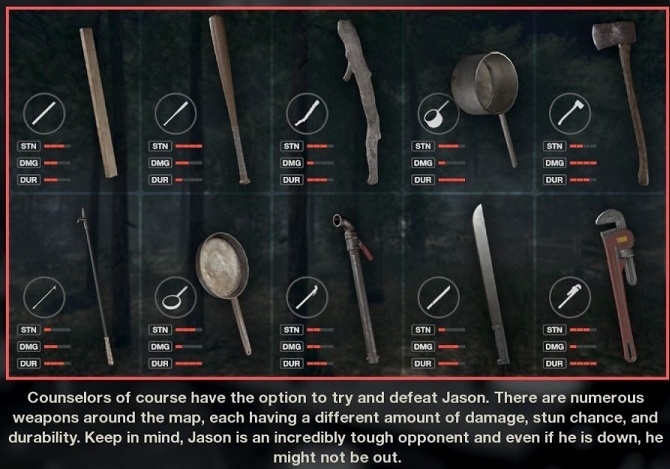 In Friday the 13th: The Game, you will use the weapons to stun the serial killer. If you want to kill Jason, you have to get together and fulfill some prerequisites. Some weapons in the game are less suited for combat than others. If you have chosen a counselor and started the round, you should definitely equip yourself with one of the weapons - no matter if your team can deal with it very well or very badly. You can also unlock Perks, which allow you to start with a weapon. Wooden Planks: Wooden Planks are quite good, but have only average durability and an average damage. You can find them on the shooting range but also on the ground outside. Baseball Bat: A baseball bat is very effective and lets you kill the killer properly. The damage is mediocre, but the durability is the worst compared to other weapons. Look for them in houses and in the cupboards. Club: With a Club you can also stun the killer and the durability is quite high. You can not really harm him. If you want to fight with a Club, look around in the area well. It lies on the forest floor and is easy to find. Pan: You will find a Pan mainly in a kitchen. For example, on the stove. The durability is sometimes the best. Damage does not necessarily divide the cooking pot, but can kill the killer well. Axe: An axe is very durable and causes high damage. If you want to kill the killer, you have an average value available here. You can also find axes in houses on the cabinets, but also in the barn. Sometimes this weapon also hangs on walls. Poker: The poker has not high value during the stun and therefore is not suitable for this. The good durability is the best reason to use this weapon, because the damage is only average. You will always find this weapon beside a fireplace in the houses. Frying Pan: Like the pan, you will also find the frying pan in the kitchen. The values are the same as for the pan. The difference is more likely in the optics, whereby the frying pan appears somewhat lighter and therefore more swingable. Pipe: Pipes are good in their durability, but the damage and the value during the minting are only average. Pipes can be found in houses in and on cupboards. If the killer gets you, you will be able to free yourself with the pipe. Machete: The Machete, together with the Poker, belongs to the weapons, which have the least Stun power. It has a good durability and causes quite good damage. You can also swing it quickly. However, you should start with the swing only when you are too close to Jason and then hope that you can escape. Wrench: Use a pipe wrench to help another player from the catches of Jason by hitting the killer. Look for them in houses on tables and in cupboards. The damage of a pipe tong may be slight but the durability is the best. You can also stun the opponent quite well. Shotgun: The damage of a shotgun is very high and you can take Jason with this weapon. Unfortunately, you only have one shot at a time, so the durability is very low. Keep the ammo in the shotgun for emergency situations and hit the killer, because if not, his chances are pretty good to catch you. Find a shooting range to find a shotgun or even in a hut on the cupboard. Tommy Jarvis always spawns automatically with a shotgun. Pocket Knife: This is not really a weapon, but rather an item, but you can escape from the catcher's hold. So if you find a pocket knife, then take it with you. You will find it in the cabinets in houses.